Our goal for this coldest winter ever was to escape south as often as we could manage. A mere few weeks after we returned from being in Bahamas for the month of February, we were packed again to head to Miami to board with Oceania Cruises. We had originally booked one 12 day cruise of Caribbean Islands . Then we got a great Canadian Boxing Day sale. While we were in Bahamas, our travel agent offered us a back-to-back cruise to add 14 more days. It was an interesting set of Central and South American ports cruising the Western Caribbean. We quickly cancelled hotels and paid the ridiculous airline change fee. And we were booked for a 26 day cruise! Not trusting the reliability of winter flying out of Toronto, we arrived in Miami 2 days early to reduce the stress of last minute travel. And warm us up a little. Figuring this was just a quick stop, we booked a hotel by the airport. For some reason rates were sky high for these 2 days everywhere in Miami (and the airport was a bit less expensive). David researched what was going on in Miami to explain the high hotel rates but found nothing. But when we got there, the high rates were easily explained by three things – a busy cruise port with weekend departures, a downtown music festival and the 100th Anniversary of South Beach. The Hilton was right on the lagoon with a great view of the airport and the Miami skyline. It had a bit of a resort feel to it. But it certainly did not meet what we would normally expect in this hotel brand. Checking out for over $1000 for two nights made us question this pre-cruise expense for the future. Next time we might not spend the exorbitant rates and might use cruise-arranged flights and transfers to deal with any same day flight issues. It was a quick trip from the hotel to the cruise dock. With a short wait we were processed as Concierge level guests. Because we had upgraded at the last minute, the baggage tags we had been mailed were now wrong so we were left to roll all our luggage on board rather than check the big pieces. This at least meant we knew our bags made it onboard and to our stateroom. The first day process was not new for us. When they cleared our cabin for access, we went and immediately unpacked. It was so nice to know we would not have to pack for 26 days! The changeover day between the two cruise segments would prove to be a bit of a mystery right up until we almost arrived in Miami. Lunch was served in the buffet restaurant and since everyone had to eat in this one place over a short period of time, it did not endear many people to buffet eating. We didn’t grumble about the lifeboat drill. One woman showed up in her “free” slippers. Maybe worried that she would lose these in a real emergency? We all wondered about how small the lifeboats looked. But we figured it was not ever going to be about comfort! We did worry however about the large number of mobility challenged people and their ability to move quickly enough if really needed. Once we were released from the lifeboat drill we went up to our cabin and sat on the balcony to watch as we departed Miami. It started our vacation cruising the Western Caribbean on a good note. The entertainment on the first night introduced most of the guests to the staff. We met the cruise director Ray, the core of the shipboard entertainment team and the captain with his leadership team. Ray would broadcast several times a day over the PA after the captain did daily updates on progress, weather, deviations and customs clearance. If you managed to miss those updates, the onboard daily newsletter provided all the info you needed to get thru each day. It had been a few years since we had been onboard an Oceania ship and within a few days we were so happy we had chosen this luxury escape. Customer service excellence was demonstrated at every turn. We had a Concierge level suite on a higher deck that included a balcony with a unique view out the very front of the vessel. This offered a great spot to sit as we cruised in or out of port or when we paused for sunrise or sunset pictures. The cabin was a little less fun on the really bad sea weather day as the wind whipped and ripped at the door. The balcony got water logged. We debated whether the bed placement (across the beam of the boat) was better on the rough sea days. I used anti-nausea (seasickness) bands and Gravol a few days. But most of the trip I was fine. The cruise ship is a giant floating luxury resort . Make sure you balance great port days with enjoying the ship. We spent some quiet time in our cabin. But usually found just the right spot for a fresh cappuccino, some background music, a quiet spot to read, some sunshine or some company. 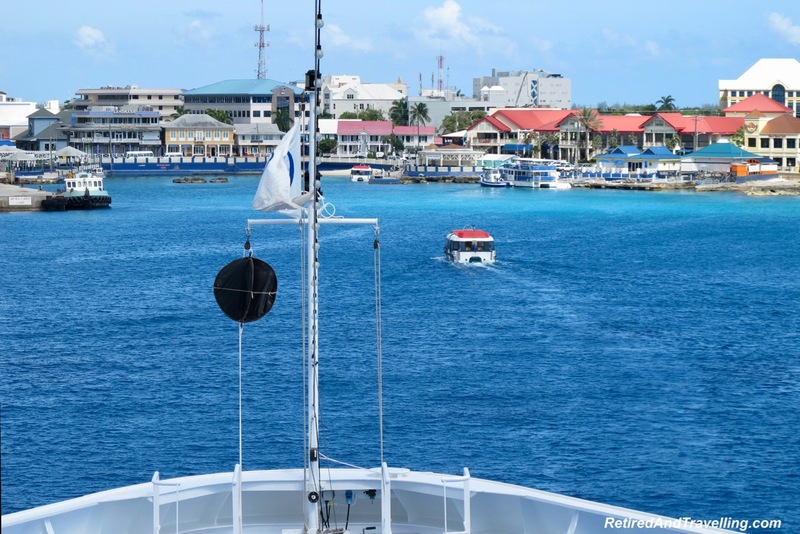 While cruising the Western Caribbean, we booked a number of excursions to poke our noses into new ports but in some ports we just wandered on our own. We visited Key West several times before so no tour was needed. We departed the ship and just wandered around visiting this quaint town. I was hoping to pick up fancy sea sickness bands that vibrate. But could not find them anywhere. I will have to remember to order them online before our next cruise. We found them very effective when we went whale watching in Monterey. We made sure to find a spot to enjoy real key lime pie. But this time only limited it to one tasting! The cruise ships dock in a manufactured town on the Mexican coast. The cruise port was built by a small fishing village (Mahahual). It got more developed around the cruise port to support the staff working in the port. All of the offered tours took you somewhere other than this cruise port – whether it was a trip to the ruins, snorkelling or 4x4s on the beach. We debated with ourselves when planning this cruise but finally booked a scuba diving excursion. When we landed and saw the waves smacking at the dock, we wished we had passed on an excursion in this port. We did two dives on our scuba excursion in heavy current and surge. There was mostly small fish but we saw a large range of soft coral. It would be our heavy exercise for the day. This was certainly needed given how good we found the food on the cruise! This would be the first of many ports where we landed on the Caribbean side. The ship docked in a commercial port of a small, poor town. We quickly found out that the nicer parts of the country were located closer to the Pacific side. This was a point we remember if we planned a return visit to any of these countries. We did a long countryside tour by bus and then boarded Lanchas boats for a tour of the Rio Dulce. There was a stop at the Castillo de San Felipe de Lara. We visited Roatan many years ago on a Carnival Cruise and took a scuba diving excursion. So we decided that we would explore Roatan on our own and wing. Then decide what we wanted to do. While we were originally been booked to be tendered in, rough seas caused another cruise ship to abandon this port. This meant we got lucky and docked at Mahogany Bay in place of the departing cruise ship. The cruise port had a lot of good shopping. But more important to us, there was a great long sand beach very close. You could take the ski lift to get to the beach. Or take a short 20 minute stroll along the tree shaded path or the water nature path. There were lots of water sports options if you wanted a more energetic day. The beach offered restaurants, bars and lots of beach chairs. If you walked all the way to the end, the pier provided stairs down into the water. It was an easy entry for snorkelers wanting to sample the reef that was a short swim out. We boarded a bus for the ride over the bumpy dirt road deep into the heart of the Veragua Rainforest. We had a great educational tour to see just a small slice of the awesome bio-diversity of this country. A short canopy ride in a gondola got us to the lower forest for a hike to the small waterfall in the forest. This was one of the highlights of this cruise. Our tour guide Arthur exceptional. We travelled from the Atlantic to the Pacific in a dome car train, got a quick view of colourful Panama City and then got to see a few massive ships going through the Gatun Locks. While it might be interesting to actually transit the Panama Canal, we got to observe the canal and the locks from an external perspective. Not to be missed when you are in Central America! David and I started out divided on the allure of Cartegena. And even though we saw no armed Contras in the streets, David remained unconvinced that Columbia was going to be on his future travel list. As we entered the port, we saw a very modern city spread out before us. Our energetic tour guide Maria, force marched us from tourist site to tourist side and ensured we got a broad but thin slice of Cartagena. It felt very European to me. I was drawn by the allure of small streets with balconies that overflowed with vibrant coloured flowers. There was colour everywhere you looked. David was more turned off by the aggressive hawkers that pursued tourists at every stop. The onboard Emerald specialist offered to devise a 10 day Columbia tour for us and maybe one day we will be back! We have visited Jamaica a lot of times (it is a quick non-stop flight from Toronto). On previous visits we saw the Dunns River waterfall at Ochos Rios. Once all the tours had left, we wandered in for a walk by the small waterfront and did a little shopping. David found the Appleton “Blue” rum that had been recommended to him by a Jamaican on board. But he refused to pay the tourist price of $200US (when he had been told it could be had outside of a tourist port for $80). David also searched for good coffee. But could not find anyone to really educate him on why the Blue Mountain coffee beans were superior. They were twice what we paid at home for pure Arabica bean Italian roasted coffee. We were warned to not even consider ground coffee as the “blend” could contain almost anything! Needless to say, we did not go home with rum or coffee. We visited Grand Cayman and scuba dived there on a previous cruise. So we looked forward to a great two-tank reef or wall dive that we booked as a ship excursion. We were disappointed when we learned there were no other divers. Because the dive company canceled our dives. We adapted quickly and decided we would try this town on our own. Georgetown was a tender port. This made it a shorter shore day and we miscalculated a little. We thought that we would shop first and then return if we decided to snorkel. It turned out that we should have passed on window shopping and brought out snorkel gear and swim suits. The snorkelling just to the side of the pier looked great! There were massive fish right at the ladder. And we saw people snorkelling far out along the reef. 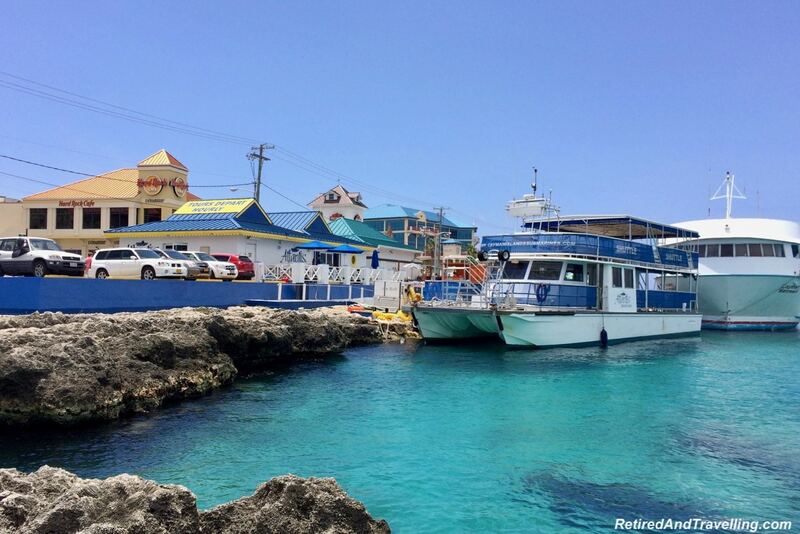 The next time we visit Grand Cayman, we will definitely plan on a beach and snorkel day! On “at sea” days, we took advantage of the wide variety of amenities onboard. Some days we were lazy and lounged by the pool. On other days we carted laptops and tried to catch up on blogging and picture editing. We learned a bit at a few seminars to help us be prepared for the upcoming ports. We typically planned our entertainment around the special guests. On this cruise we were again delighted with this selection. We had two of our absolute favourite ways to spend time on the ship. When we could, we listened to the eclectic and amazing sounds of the Pudra String Quartet . Or we watched the antics of the onboard chefs in the cooking demonstrations. Most nights we fell exhausted in bed, never really sure where the days went! We arrived back in Miami after 14 days with our sea legs firmly set in and still excited about staying on board for another 12 day cruise! We finally got the processes figured out for our one day back in Miami. After the crowd was gone, we headed into Miami for a shopping day. While we had planned to walk, David found the free trolley that would deposit us exactly in the part of Miami we needed. The bargains were plentiful. I used this as an excuse to replenish my cruise wardrobe a bit. And we picked up the few things that we were looking for (including an adapter for the European outlets onboard the ship). Re-boarding the ship, we spent the rest of the day in port as the experienced cruisers we now were. We didn’t fuss about hunting for food, found a quiet spot away from the confused looking new guests and just relaxed. The next half of the cruise was heading to the islands of the Eastern Caribbean . And offered a much different set of destinations and excursions than we saw cruising the Western Caribbean. Our first stop after 2 days at sea was Antigua, known for its 365 beaches. That could not be better designed for us northern beach lovers! Have you done a cruise to the Caribbean side of Central America? 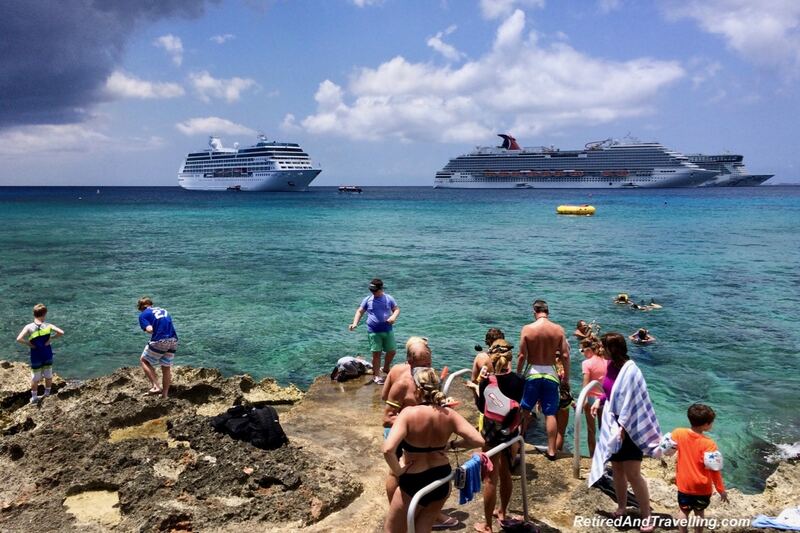 What should be plan on doing when cruising the Western Caribbean again?